…continue from the previous post. Once the model is build and Loss and Validation functions are satisfied our expectation, we need to validate and test the model using the data which was not part of the training data set (unseen data). The model validation is very important because we want to see if our model is trained well,so that can evaluates unseen data approximately same as the training data. Otherwise the model which cannot predict the output is called overfitted model. Overfitting can happen when the model was trained long enough that shows very high performance for the training data set, but for the testing data evaluate bad results. We will continue with the implementation from the prevision two posts, and implement model validation. After the model is trained, the model and the trainer are passed to the Evaluation method. The evaluation method loads the testing data and calculated the output using passed model. Then it compares calculated (predicted) values with the output from the testing data set and calculated the accuracy. The following source code shows the evaluation implementation. // expected labels are in the mini batch data. The implemented method is called in the previous Training method. As can be seen the model validation has shown that the model predicts the data with high accuracy, which is shown on the following picture. This was the latest post in series of blog posts about using Feed forward neural networks to train the Iris data using CNTK and C#. The full source code for all three samples can be found here. In the previous post we have seen how to train NN model by using MinibatchSource. Usually we should use it when we have large amount of data. In case of small amount of the data, all data can be loaded in memory, and all can be passed to each iteration in order to train the model. This blog post will implement this kind of feeding the trainer. The output column is encoded to 1-N-1 encoding rule we have seen previously. As can be seen both arrays are 1D, which means all data will be inserted in 1D, because the CNTK requires so. Since the data is in 1D array, we should also provide the dimensionality of the data so te CNTK can resolve what values for each features. The following listing shows the loading Iris data in two 1D array returned as tuple. Once the data is loaded we should change very little amount of the previous code in order to implement batching instead of using minibatchSource. At the beginning we provides several variable to define the NN model structure. Then we call the loadIrisDataset, and define xValues and yValues, which we use in order to create feature and label input variables. Then we create dictionary which connect the feature and labels with data values which we will pass to the trainer later. The next code is the same as in the previous version in order to create NN model, Loss and Evaluation functions, and learning rate. Then we create loop, for 800 iteration. Once the iteration reaches the maximum value the program outputs the model properties and terminates. Above said it implemented in the following code. This blog post is going to present how can you implement license functionality in your .NET application. Providing license in your .NET application is very challenging because there is no standard procedure for the implementation. You are free to use whatever you want. But be notice, there is no license which is 100% safe and cannot be cracked or bypassed. For this purpose I have selected the CocoaFob library for registration code generation and verification in Objective-C applications. Mainly the library is for Objective -C based applications, like iQS mobile applications and other OSX based applications. This is very interesting library but you cannot use it in .NET applications, there is no implementation for .NET Framework. The library uses DSA to generate registration keys, which is very hard for hackers to produce key generators. The library is also specific because it generates license key in human readable form, when the bytes are converted in to Base32 string to avoid ambiguous characters. It also groups codes in sets of five characters separated by dashes. Also DSA has encryption algorithm generates the license which is different every time because of a random element introduced during the process. The library is using BouncyCastle.Crypto Nuget package for DSA encryption and decryption. LicenseData class which provide License properties which is used in license generation. It an be anything: Name, Product number, email, date of expiration etc. LicenseGenerator class which is responsible for encrypting and validating the license. As can be seen from the code snippet above the License data contains username, product key and email address. Also, only name property is mandatory, which means you can generate license key based on the user name only. One we have License data we can process of License key generation. License is generated using DSA encryption which uses SSH private key. You can generate public and private SSH keys using any of the available tools, eg. OpenSSH, GitHub bash, …. More information about private and public key generation you can find at this link. Once we have public and private keys we can generate license and validate it. One important thing to remember is that you have to care about your private key. It should always be secure and no one should have access to it. The magic happen in this method during the conversion of signature from bytes to human readable string. Conversion is done using Base32 string helper method. As can be seen from the code above, the validation process is done by generating licenseData, converting the license Key in to signatere and the validation process return true is the license is valid, otherwize return false. The Library solution contains unit test project which you can see how to use this library in the real scenario in order to implement licensing in .NET app. 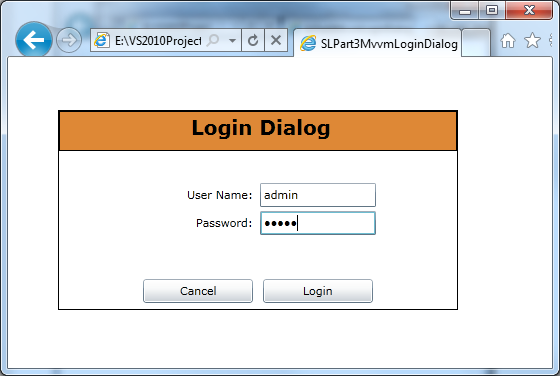 In the third article, of the series of the Silvelright Business application development, I will present Login dialog implementation by applying MVVM pattern. Problems looks very simple but if you want to implement in MVVM fashion you could encounter some problems. MVVM pattern became very popular in Silverlight and WPF application development and it seams to be standard development pattern. More information about the pattern can be found on various blogs, internet sites and forums. One of the first and the best article about MVVM patern is MSND article about MVVM patern by Josh Smith and it can be found here. This tutorial assume that you know basic principles of the MVVM pattern as well as Silverlight application. In tis tutorial we will use the MVVM toolkit the implementation of the MVVM pattern developed by Laurent Bugnion, which you can download at http://mvvmlight.codeplex.com/. Before we start the tutorial, download the toolkit and install it as it decribed on the codeplex site. The idea of the Login dialog, presented here, not depends of the MVVM light toolkit, so it can be easily implemented with other MVVM pattern, like PRISM and others. 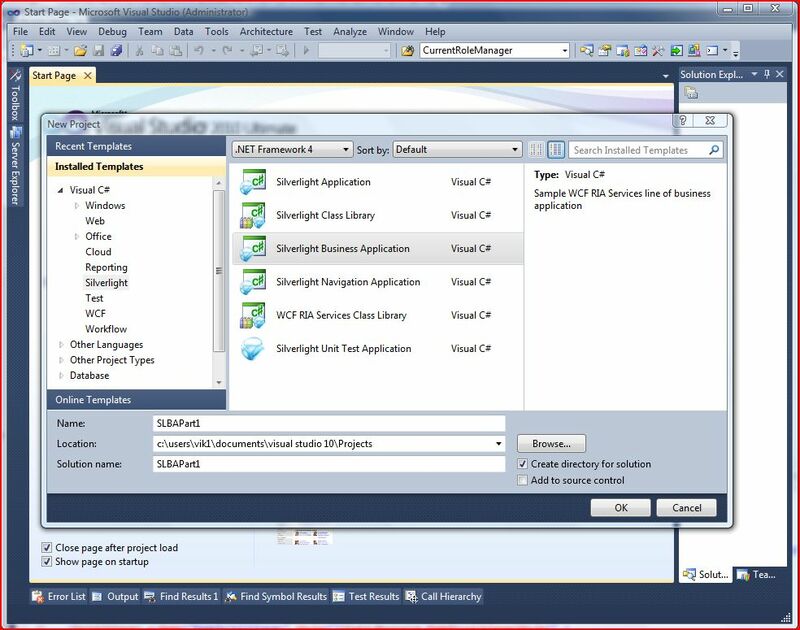 Start Visual Studio 2010, and select File->New –>Project, select Silverlight Application in the same way we implemented in Part 2. 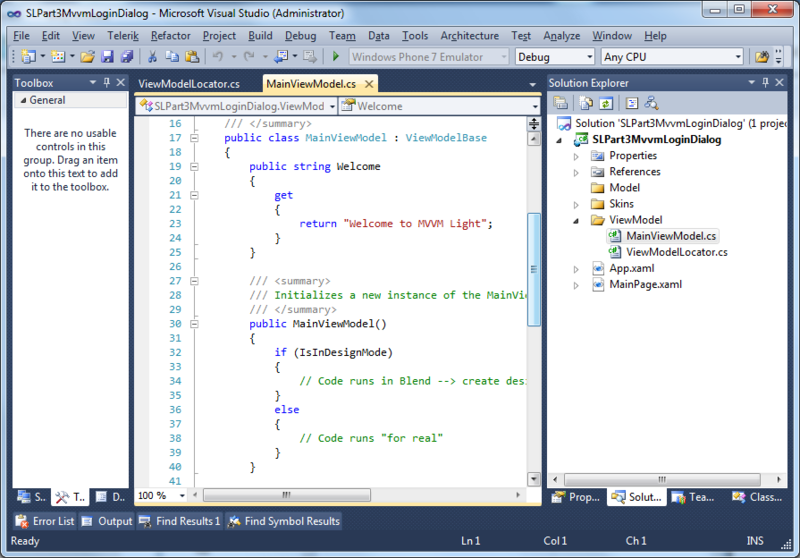 Instead of Silverlight Aplication, select MvvmLight (SL4) template as picture below shows. After we choose the template, and click OK, Visual Studio designer created Silverlight application which support MVVM pattern. 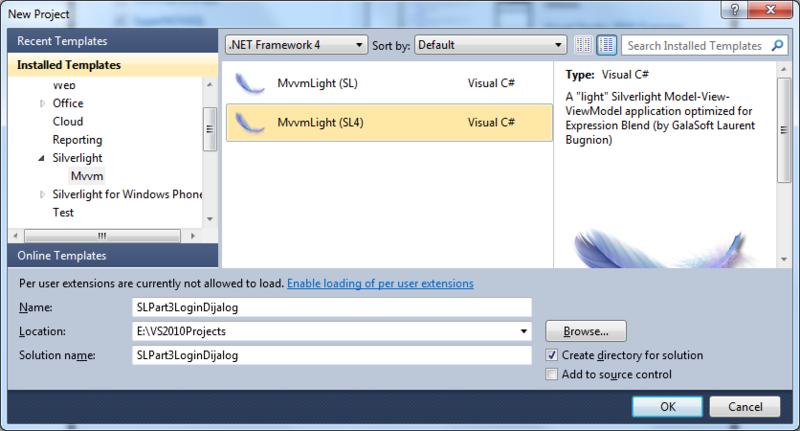 As you can see Visual Studio created Silverlight application, but not the ASP.NET web application project. For this tutorial we don’t need it. The picture above shows project files and how files are arranged in the project. The folder ViewModel contains the ViewModels implementations. Lets create View folder, it will contain Views implementation. MainViewContent will be our main content for the Silverlight application. It will be shown after we logged in. 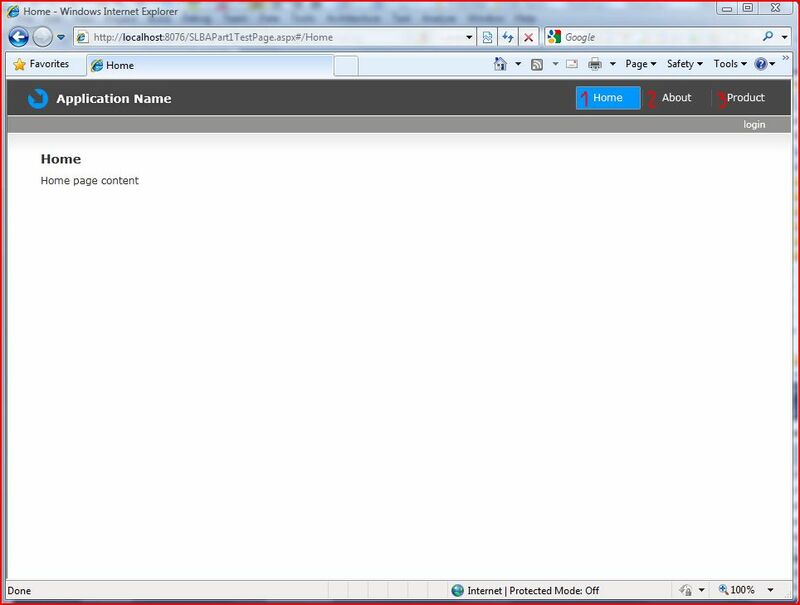 <TextBlock Text="MAIN CONTENT OF THE SILVERLIGHT APPLICATION"
Implementation is simple. Just TextBlox with some text. The implementation is empty cause we want the empty view model without interaction with the view . 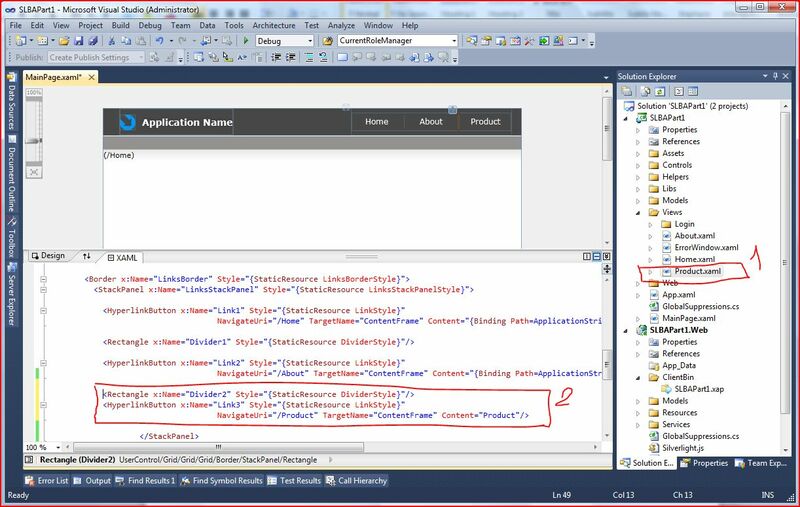 Similar as previous we create LoginView.Xaml and LoginViewModel.cs. <TextBlock Grid.Row="2" x:Name="textBlock2" Text="User Name:" Padding="5" HorizontalAlignment="Right"
<TextBlock x:Name="textBlock3" Text="Password:" Grid.Row="3" Padding="5" HorizontalAlignment="Right"
<TextBlock x:Name="textBlock1" Text="Login Dialog" VerticalAlignment="Center" HorizontalAlignment="Center"
Grid.ColumnSpan="2" Margin="10,5,5,12" Grid.Column="1" FontFamily="Portable User Interface"
The main part of this xaml code above is that the MainViewModel is passed as a parameter of the Login button EventToCommand, and if the login is correct, the LoginModelView change IsLoggedIn property to true. Then main page switch the visibility property of the LoginView to Collapsed, and MainContentView to Visible. ModelView coresponding classes is always derived from the ModelViewBase. Now, when you implemented Login and MainContent, we need put these objects in to MainPage. The MainPage is responsible of showing and hiding these views. // Code runs "for real"
As you can see we implemented IsLogged property, which is the switch between Login and MainViewContent. With BoolToVisibilityConverter class, we were implemented changing visibility of the Views. The converter class is in the source code of the project attached with this tutorial. Now at the end we have to implement LoginVieModel and MainContentViewModel in to Locator class. The implementation is very simple and you can see it in the sourcecode project. Now run the application and clik the Login button, The MainContentView appears. This article present the simple technique you can easily implement in your Silverlight application with full fashion of the MVVM pattern. The source code can be download from here. Currently I am trying to learn Silverlight Business Application development, and during this phase I will try to post some interesting tips and tricks on which I will encounter. I hope you will find some of a code usefull. In this post I will show how to create starting silverlight business application skeleton, and how you can manipulate with users, roles and content within Silverlight application. As you already know, Silverlight BA uses ASP.NET database model in order to display or hide business data via RIA Services. So, if you want to develop SL application with several modules and each module can access different set of users, you need to handle with users and rolls similar as in ASP.NET application. In this post we will make demo with three pages. Each page will be opened with different users, and admin can open all pages. 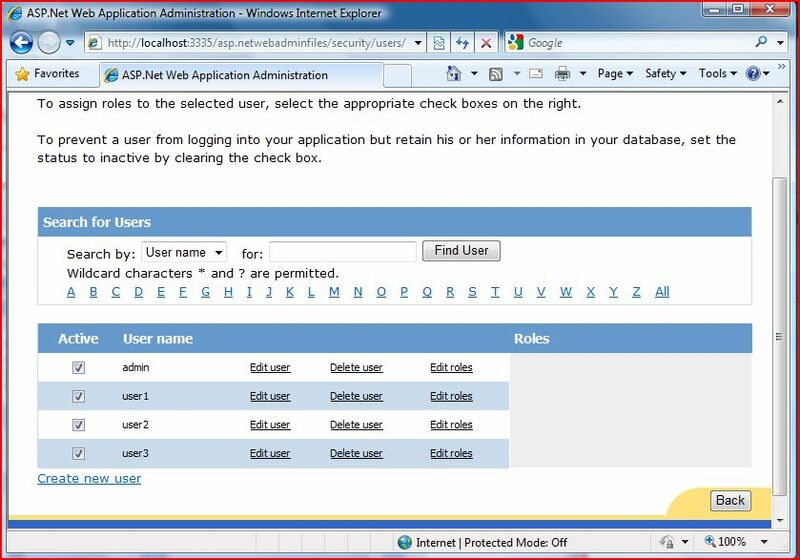 The screenshot below shows the SL application. Name the new project SLBAPart1 and choose OK button. The VS designer will do a lot of works for us in order to generate starter business application. VS designer generated the two page, completed login and user registration logic as well as database and RIA services. We will add another page called Product, and implementi another link button in mainpage.xaml (see picture below). 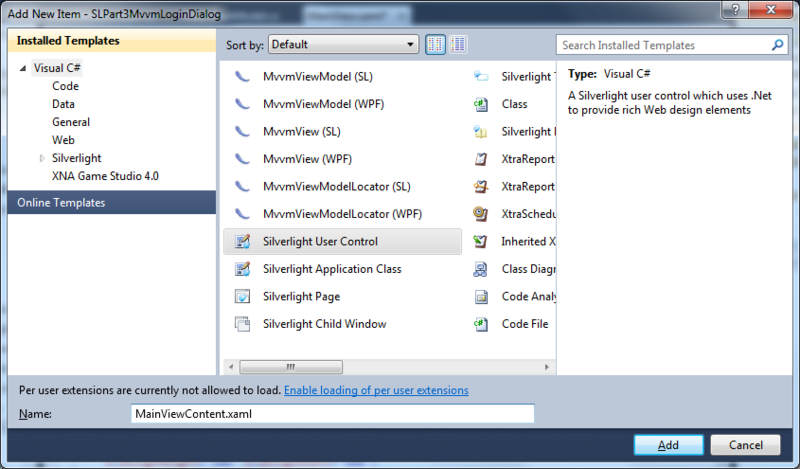 In opened dialog choose Silverlight Page name it Product and click OK.
Add xaml code as depicted on the picture above. When you run the application you can see the application similar as the first picture shows, which you can access all three pages. There is also “login” link button wich you can login as well as register a new user for SL application. To define user membership in SL application, select SLBAPart1.Web project and choose menu ASP.NET Configuration from the Project menu of Visual Studio 2010. Internet Explorer page shows content similar like picture below. 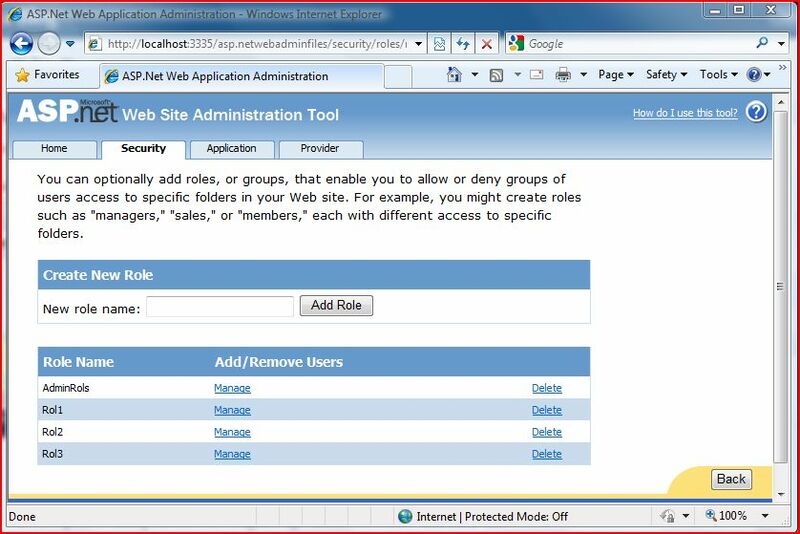 Choose Security link button, and click on Creates and Manages roles. Define four roles like picture shows below. Click Back button and create four users with corresponding roles. The final result of user defining is shown on picture below. Each user has its own corresponding roles. When you use the attached sample pasword for each user is defined similar as for the first user “$user1user1“. Password for admin user is “$adminadmin“. After we defined roles and users it is time to define content for each page. Open Product.xaml page from Visual Vtudio project, define content like picture below. We have to define Public.xaml page which can be accessed if we not logged in. 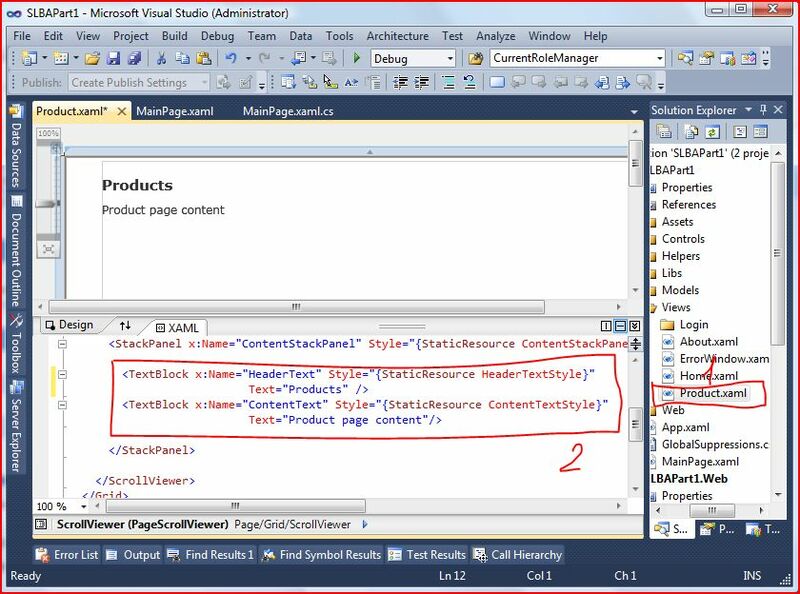 Similar to previous page creation define Public.xaml page, and put some text in it. 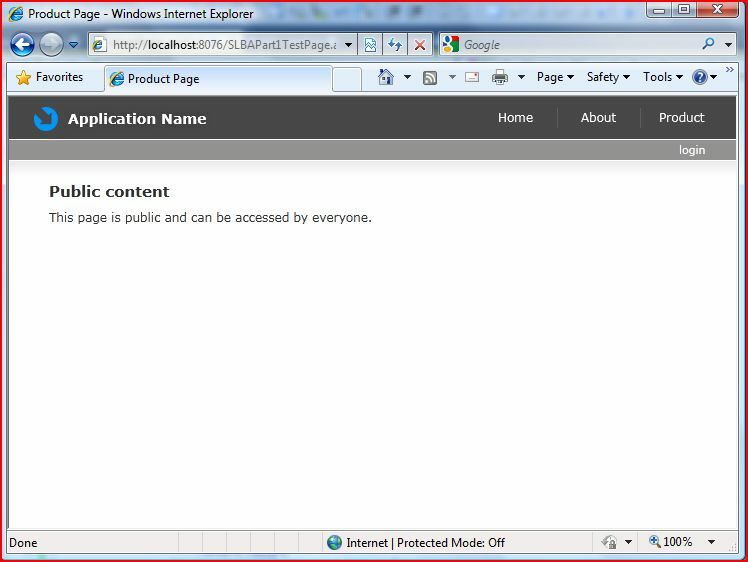 Next step in implementation is prevent user to see content if it is not authorized. To implement that, we need to expand ContentFrame_Navigated event of the mainpage.xaml.cs. Build application and run. The picture below shows our application. If we try to navigate to any content before we LogedIn we always get the same public content. Depending on user information when we logged in ,we get coresponding content. Thats all for now. We learned how we can manipulate with content and different user roles. Source code for this demo can be downloaded from here.